The Sikh religion was founded in the Punjab region of India but has now spread throughout the world with approximately 500,000 followers in Britain. Sikhs believe in one God. 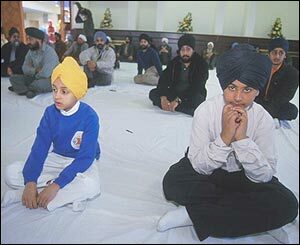 Children are born into the Sikh faith but choose whether to take Amrit - the ceremony of commitment to Sikhism - later in their lives. 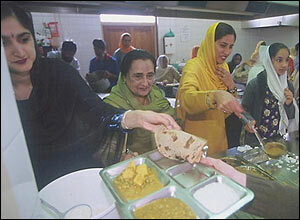 Sikh Gurdwara - or temples - contain free kitchens for people of all faiths. Only vegetarian food is served but Sikhs are not bound to be meat free, though Kosher or Halal meat is forbidden because of the animals' slow manner of death. The Sikh gurus taught that all people are equal regardless of race, caste or gender. 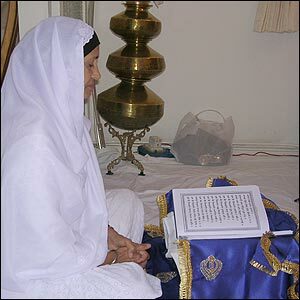 Any man or woman who has taken Amrit is able to conduct scripture readings and other services. 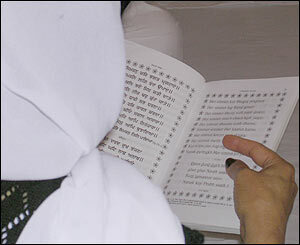 The Sikh holy book - the Guru Granth Sahib - is respected as if it were one of the Gurus themselves. For this reason, it is never allowed to touch the ground - nor is any item containing excerpts of scripture. Once they have taken Amrit, Sikh men take the name Singh - or Lion. They carry the five Ks: Kesh - uncut hair, Kara - a steel bracelet, Kanga - a wooden comb, Kaccha - a cotton undergarment, and Kirpan - a ceremonial sword. Men and women are required to cover their hair in Sikh Gurdwaras but the most religious keep their hair covered at all times. 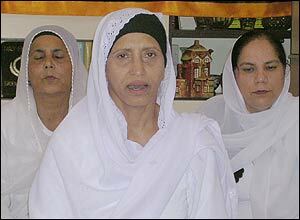 Gurdev Kaur wears a black "keski" under her headscarf. 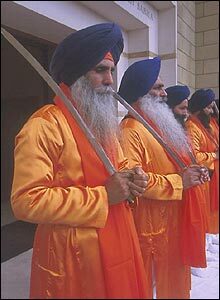 Sikhs are not permitted to cut or dye their hair as this is changing the human image created by God. 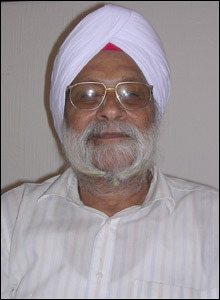 Here, Gurdev Kaur's husband, Avtar Singh, has tied his beard under his chin.